Please check www.lbma.org for tickets and further information on the opening festivities. Long Beach (CA) – The Long Beach Museum of Art presents Vitality & Verve: In the Third Dimension, a sequel to last year’s record-breaking exhibition Vitality & Verve: Transforming the Urban Landscape, which saw over 22,000 visitors to the Museum last summer. Presented in collaboration with POW! WOW! Long Beach and Los Angeles’ Thinkspace gallery, Vitality & Verve: In the Third Dimension showcases works by some of the world’s best street artists, muralists, and new contemporary artists placing an emphasis on their unique sculptural and installation practices. Highlighting this steadily expanding young art movement within a mainstream, museological context, the exhibition celebrates its momentum and cultural presence. The new contemporary movement may have begun in the public and urban domains, but now steadily continues to assert its significance within museum walls. Historically urban public art in general has had to create contexts for the reception and support of its work in the community. It has never been fixed to a singular genre but rather has prospered with fluidity and expanded into all manner of techniques, expressions, media and spaces. This exhibition captures an historical moment of transition in the global trajectory and increasing diversity of new contemporary art. Each artist interpreted the Museum space with site-specific installations, murals, and sculptural vignettes, collectively transforming all 8,000 square feet of the venue in an environmental immersive experience. Participating artists include Craig ‘Skibs’ Barker, Susan Beiner, Rebekah Bogard, Bumblebeelovesyou, Isaac Cordal, Patsy Cox, Ariel DeAndrea, Aaron De La Cruz, Sergio Garcia, Glazed Paradise (Mark Jenkins & Sandra Fernandez), Andrew Hem, Kiel Johnson, Sarah Joncas, Jean Labourdette (aka Turf One), Drew Leshko, Aaron Li-Hill, Troy Lovegates (aka Other), Telmo Miel, Jaime Molina, Brendan Monroe, Luke O’Sullivan, Felipe Pantone, Erika Sanada, Slinkachu, Mark Dean Veca, Cinta Vidal, Hilary White, Yoskay Yamamoto, Alex Yanesw, and Ernest Zacharevic with Martha Cooper. 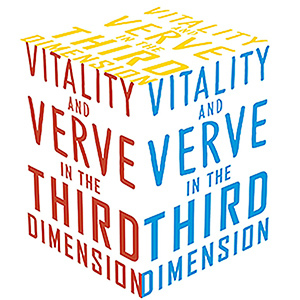 Vitality & Verve: In the Third Dimension captures the diversity, breadth, and complexity of an art movement no longer confined to subcultural recesses, singular applications of media, or even two dimensions. The artists are working across an impressive array of materials including fiber, wood, plastics, acrylics, resins, cardboard, textiles, paint, ceramics, cement, paper, and reclaimed industrial materials. Activating the spaces of the Museum with murals, site-specific installations, sculptures and immersive environments, the collaborative energy of the complete transformation highlights the heterogeneity of its participants. By elevating the social and experiential above the formal and academic, these works speak with an immediacy that connects disparate worlds and spaces. Technically accomplished, and undeniably manifold, the artists in this exhibition combine a variety of styles and aesthetic influences to transform and occupy the interior and exterior spaces of the Museum in unique ways. Perhaps most unified by its lack of stylistic exclusion, Vitality & Verve: in the Third Dimension captures the new contemporary art’s tireless energy and profusion, showcasing its continual tendency to change, morph, develop and defy all confines. V&V3D will be one of several locations in Long Beach this summer that will feature art for the public. POW! WOW! Long Beach 2016 will return with mural projects, gallery shows, and exciting programming throughout downtown and nearby locations. 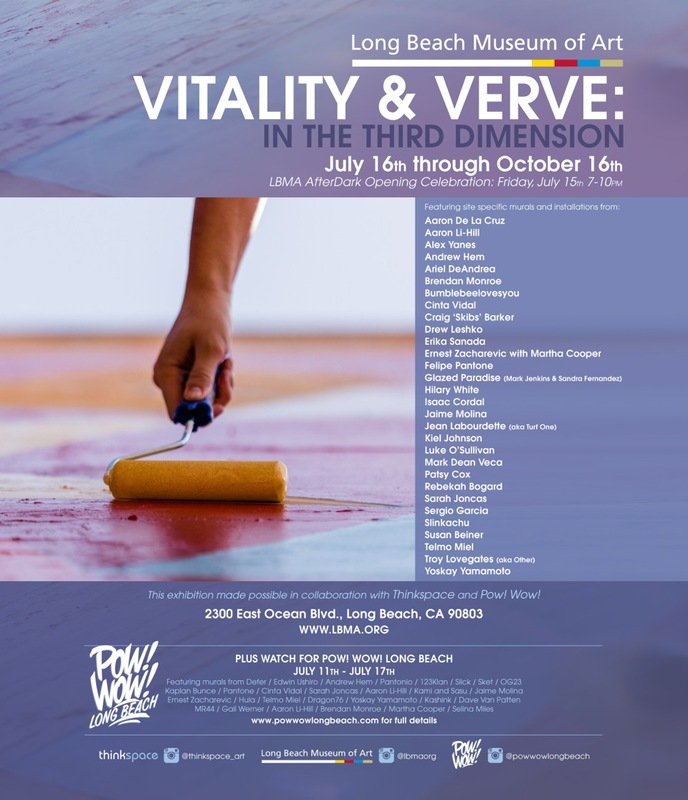 The presentation of Vitality & Verve: In The Third Dimension is made possible by the generous support of The Port of Long Beach, JetBlue, Pasadena Art Alliance, the Bauer Foundation, and Thinkspace Gallery. About the Long Beach Museum of Art : Located on a magnificent bluff overlooking the Pacific Ocean, the Long Beach Museum of Art features a historic mansion and carriage house, expansive galleries and gardens, oceanfront dining at Claire’s at the Museum and a unique Museum Store. The galleries and store are open Thursday 11 a.m. to 8 p.m. and Friday – Sunday 11 a.m. to 5 p.m. Admission is $7 for adults, $6 for students and seniors age 62 and older, free for Members and children under 12, and free for everyone on Thursday evening from 5 p.m. to 8 p.m. and all day on Friday. Claire’s is open Thursday 11 a.m. to 8 p.m., Friday 11 a.m. to 3 p.m., and Saturday and Sunday 8 a.m. to 3 p.m. For more information, call (562) 439-2119 or visit www.lbma.org.